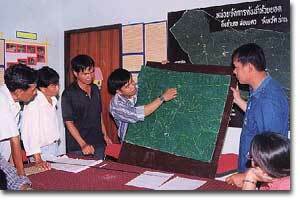 The 3D models shown below are some of the many which were produced in the framework of the Upper Nan Watershed Management Project (UNWMP) (1997 – 2003) in Nan Province, Thailand. Funded by DANCED, the project has been implemented by the Thai Royal Forestry Department. 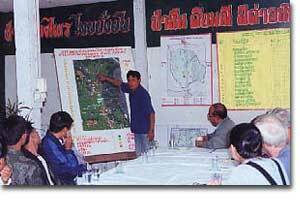 Planning a community-fire management strategy at watershed level by the use of a relief model. This 1:12,500 scale 3D model, represents the Nam Yao Watershed and includes seven villages (approx. 200 sq. km) located in the Upper Nan Watershed. The model, manufactured in year 1999, has been used for planning community-fire management. This second 3D model manufactured in 1997 at a 1:10,000 scale, represents one village located within the Upper Nan Watershed. It has been used for land use planning and village boundaries.